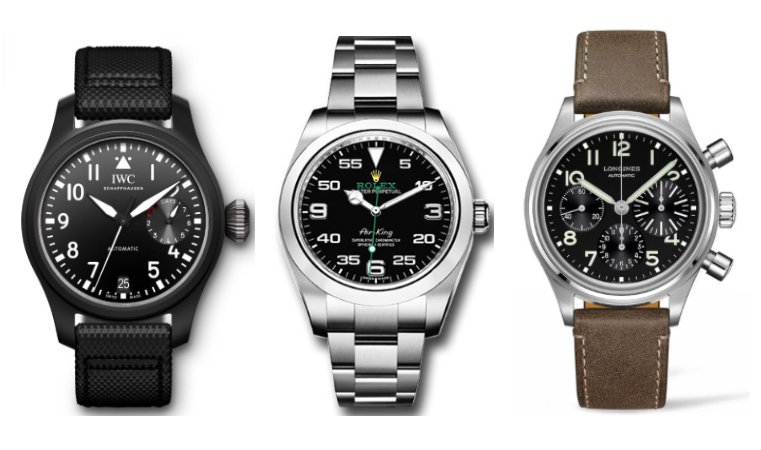 Before presenting some of the best pilot watches, let’s discuss their history and the features that characterize them. The origin of these timepieces goes back to World War I, where soldiers frequently wore military watches to coordinate attacks and communicate more effectively. As aviation became a more significant part of battles later on in the century, the pilot watch began to take form. In short, these products are essentially military pieces with a few extra flying-related features. What defines them are those capabilities, the most important of which are listed below! A large, easy to read dial. A bezel that helps with crucial aviation metrics. Multiple time zones or GMT functionality. Additionally, these pieces are almost always incredibly well made. The reason is that thousands of feet in the air is not a friendly environment, so pilot watches must be ready to brave rugged conditions. All in all, going with an aviation piece is an excellent decision. Below, we detail some of our favorites. 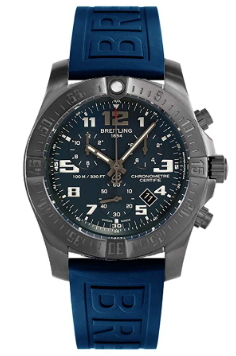 Breitling is one of the top Swiss brands in the world, yet they manage to keep their prices at a somewhat affordable level. This piece is an example of that trend, as it is sports superior craftsmanship, incredible durability, and can be bought for a reasonable price. As far as pilot-specific capabilities, this model is not short on features, the most impressive being its highly functional chronograph. It is also one of the best time zone changing watches out there, so world travelers will not spend much effort on resetting it depending on their location. While the Breitling above has a futuristic aesthetic, this IWC goes back to the roots of aviation watches. 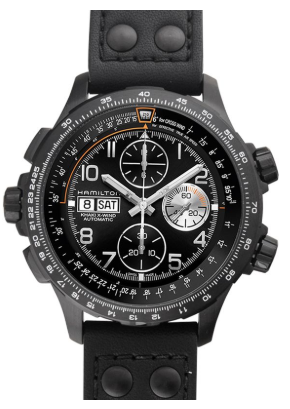 As we mentioned above, this type of timepiece is a close relative to military pieces. The IWC pays its respects to that relation with a green strap and simple dial. One thing that is particularly divisive about this piece is that its outer dial counts from one to sixty, while its inner layer has your conventional one to twelve. While some love this aspect, others may find it tiresome to look at. If you think this design feature might bother you, then go with a different option. When people ask us how they can break into the Swiss market without taking out a second mortgage on their home, we almost always give them the same brand to check out. It is Hamilton, who makes excellent pieces that can be had for relatively low prices. Regarding this specific model, the Aviation X-Wind is an absolute powerhouse. It has exceptional water resistance, is made from top class materials, incorporates a chronograph, and has a sophisticated automatic movement that performs well above its price point. On top of all of that, this watch is incredibly attractive, combining a black dial, stainless steel case, and leather strap. Almost no list of watches is complete without a Rolex model. What is surprising about this piece, though, is that Rolex is best known for their dive pieces. 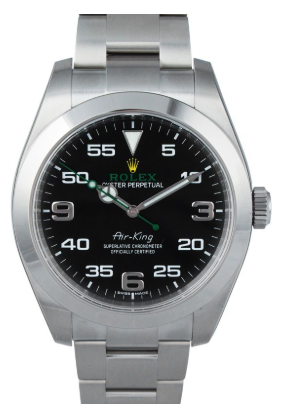 Still, the Air King can compete with any other pilot watch in the world. One thing customers love about it is its simplicity and elegance. Rather than having a crowded dial and a bezel, it has a clean, clear design. This feature allows it to be appropriate no matter what environment you wear it in. The first thing that catches your eye when you look at this piece is its luxurious vibe. 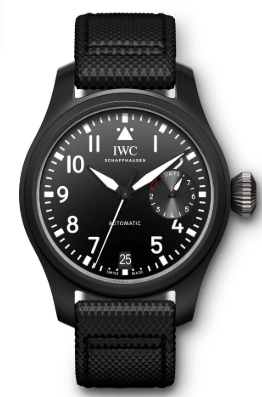 Between its black dial, silver case, and black leather strap, it is one of the more attractive aviation options out there. 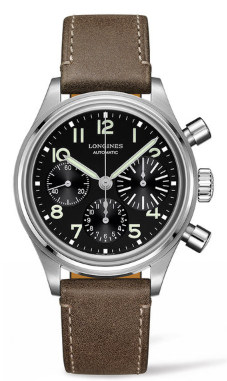 It is also backed by one of the most popular Swiss brands in the world, Longines. With an excellent aesthetic and a respected brand producing it, this watch is a safe bet. The wonderful thing about Timex is that despite their affordable prices, they produce some of the most reliable watches in the world. 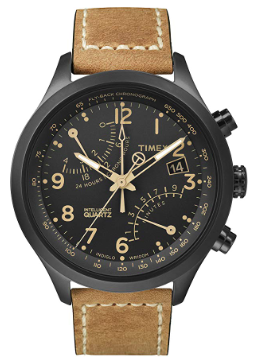 Their line of aviation pieces is no different, and this Fly-Back Chronograph is an excellent example. Somehow, they managed to fit a significant amount of pilot functions on this dial while simultaneously keeping it clean and classy. Though this piece won’t have the class and craftsmanship of some of the others on this list. It’s combination of price and quality is hard to beat. For this reason, it is a fantastic choice for those of you with a smaller budget. One way to approach the watch buying process is to choose a specific genre of timepiece. Selecting the pilot variety is an excellent decision, as these pieces are often attractive, well made, and useful. No matter what, you can’t go wrong with one of the outstanding options on this list. What is a Tourbillon Watch and Why are They So Expensive?